Bath & Body Works: FREE Wall Flower Fragrance Refill With Purchase Of WallFlower Plug Today Only! Plus, Mix & Match Wallflower Refills 5 for $18 or 7 for $24! Bath & Body Works: $2.95 Hand Soaps Today Only! Bath & Body Works: 3-Wick Candles Buy 2 Get 2 FREE & $10 Off Orders Of $30 Today Only! 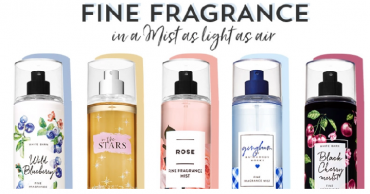 Bath & Body Works: Fine Fragrance Mists Only $4.95 Each! (Reg. $14.50) Today Only! 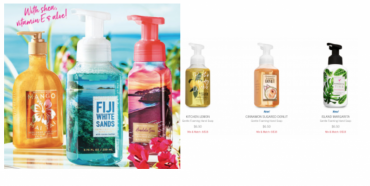 Bath & Body Works: Hand Soaps 6 For $18.00! Just $3.00 Each! Mix & Match! Bath & Body Works: $4.95 Body Cream Today Only! Bath & Body Works: Buy 3 Get 3 FREE Body Care & Take An Extra 20% Off! Fun Easter Bakset Fillers! 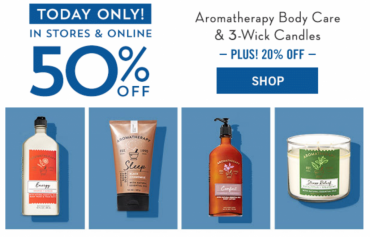 Bath & Body Works: 50% Off Aromatherapy Body Care & 3-Wick Candles Today Only! Plus, Take An Extra 20% Off Your Purchase! 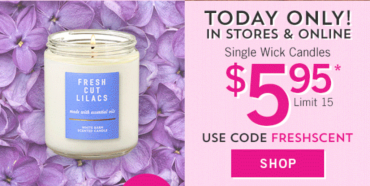 Bath & Body Works: $5.95 Single Wick Candles Today Only!